From the MRC Weatherall Institute of Molecular Medicine blog. Stem cell turnover and tissue maintenance is a stochastic process. This means that a randomly occurring mutation has an unknown chance of becoming fixed and spreading within a tissue. Clonal mutations have been observed in apparently healthy tissue, increase in frequency with age and – in some cases – have been described as a pre-malignant state (e.g. clonal haematopoiesis). 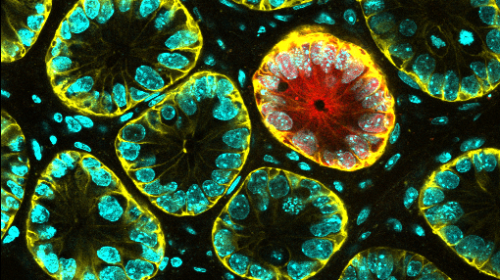 In certain tissues, such as the colonic epithelium, the contribution of mutations in stem cells to neoplastic transformation remains unclear. This process is a major interest of Ed Morrissey, who joined the MRC WIMM Centre for Computational Biology in late 2016. His group has recently published a mathematical model that aims to address how functional mutations can contribute to altered stem cell dynamics, with the hope of understanding precisely how these rare mutations accumulate in the lead up to cancer.